Michael Jackson stood and smiled Monday as he faced the first group of prospective jurors to undergo screening for possible service in his trial on child molestation charges. Some prospects gazed at the superstar, who wore a bright white suit with a jewel-trimmed vest and belt and was greeted by a cheering crowd of supporters outside the courthouse in the small central coast city. The crowd, numbering about several hundred at its peak, danced and sang a Jackson song criticizing his prosecutor, but security fences kept order, unlike a year ago at his arraignment when 1,500 or more watched the pop star dance on an SUV and surged after his vehicle as he left town. Jackson, accompanied by four defense attorneys, appeared relaxed and cheerful as he waited for more than an hour for the first prospective jurors to enter the courtroom. He greeted the clerk with a handshake. Santa Barbara County District Attorney Tom Sneddon, whom Jackson has derided in a song as a "cold man" with a vendetta, did not come to court. A deputy, Ron Zonen, represented the prosecution. Superior Court Judge Rodney Melville told prospective jurors they might have to serve for about six months but that it was an important duty. "Most of us have relatives who have fought and died to protect this service," Melville said. "Freedom is not free. Jury duty is part of the cost of freedom." Three hundred prospects came to court in two groups. The pool was predominantly white, about a quarter Hispanic and with only a handful of black prospects. Another 300 were to be processed Tuesday, followed by 150 on Wednesday. Those not excused will fill out questionnaires for study by attorneys who will select 12 jurors and eight alternates. Jackson's defense team arrived first. With them was a new face, Defense Jury Consultant Lee Miehls. She was taking notes and marking certain potential jurors even as they were walking into the courtroom. She continued to study them and take notes as nearly half of the first group asked the judge to release them from duty in this case. We could hear the fans screaming inside the courtroom as Jackson arrived. His team went out meet him. As they were coming in one of his attorneys asked him, "How you doing buddy?" Jackson replied, "I'm fine. I'm fine." Jackson then came into the courtroom where he sat for an hour with his team, six reporters, one prosecutor and court staff. At one point he went over and shook the hand of each staff member, introducing himself. He hardly ever looked our way. Jackson then sat and made small talk with his lawyers. At times the conversation turned serious and he was very intent on what Thomas Meserau was saying. At other times they joked and laughed. Jackson asked Meserau if he danced. Meserau laughed and said, "No!" As the potential jurors came in Jackson, his four attorneys and his jury consultant all stood. Jackson clasped his hands in front of him and flashed a broad smile at the jurors as they came in. He remained standing until the approximately 150 people filled the courtroom. Some of the jurors studiously avoided glancing at Jackson as they came in. Others craned their necks to get a good look at him. 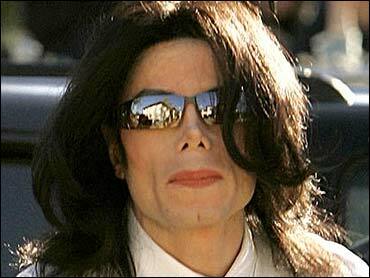 Once all the jurors were in and seated though, there was a moment in which it seemed that all eyes were on Jackson. They were studying him. You could have heard a pin drop. Then the judge came in and the process began. Jackson then faced forward and focused on what was happening. The smile was gone as he stared straight ahead, concludes Gonzales. By day's end, Judge Melville had listened to 138 people ask to be excused, but the only person he dismissed immediately was a woman who was eight months pregnant. One of the few black men in the pool told the judge he was unemployed and "six months will affect my future. I think I should worry about myself and not the defendant." A white man said that during a stint in jail he got into a dispute between a black prisoner and a white prisoner and had been branded a racist, even though he was not. Another man who had been convicted of an undisclosed crime said he was on an electronic monitor and confined to his home, and was told he would not be eligible for the jury even though he would like to serve. Melville said he would allow the man to remain in the jury pool and would call the electronic monitoring people and inform them. "I'm instructing you to stay on the panel," he said. "This is going to be a long process for these jurors and good for the judge is telling them so,'' notes CBS News Legal Analyst Andrew Cohen. "I don't think the trial is going to last six months like the judge says but I'm sure he would rather have people begging out now before they are selected than four months from now in the middle of the trial." Jackson, 46, is charged with molesting a cancer patient - then age 13, now 15 - and plying him with alcohol. Early Sunday, Jackson issued a court-approved video statement on his Web site, predicting he would be acquitted. The small-town feel of the jury pool was apparent during questioning. One prospect noted she ran a town pet shop and another she could get a medical excuse from her doctor across the street. A few said they have friends that work at Jackson's Neverland ranch. One woman said she worked at an elementary school where she dealt with "people that need counseling for molestation." Other prospective jurors said they had to care for sick relatives or had too many job responsibilities. One woman said that at age 75 she was "just too old." Legal Analyst Cohen was unsure whether it helps or hurts Jackson to be tried in a small town. "You could say it helps him because people may not be as familiar with him as they might be in an urban center. Or you could say it hurts him because small-town values might make his jurors less forgiving of his many eccentricities."